blog.borud: Overture for tesla coils, jacobs ladders and pyrophone. Overture for tesla coils, jacobs ladders and pyrophone. 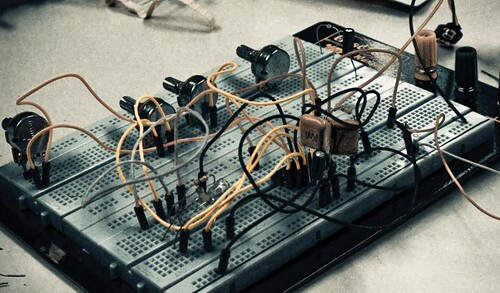 Earlier today I took part in a DIY synth workshop at TEKS. The workshop was a lot of fun. We got some hands on experience making noisy gadgets and I am probably going to continue experimenting with mine on the weekend. I've been thinking about hooking up to my Arduino to make it MIDI-controllable, though before i do that I probably have to whip out my calculator and do a bit of head-scratching to make sure that I don't fry my Arduino. The part that really excites me is that TEKS may be what Matt, Ståle, me, and others have been looking for: a place to meet other people who are interested in building stuff -- and not least, a place to do it. I talked a bit to Arnfinn, who works at TEKS, and we agreed that we should set up a meeting and discuss a bit. We also talked a bit about building an instrument based on a tesla coil. Well, actually, multiple tesla coils. I am thinking something along the lines of having 2-4 large tesla coils (anything worth doing is worth overdoing) hooked up to some oscillators and build a MIDI interface for it so it can be hooked up to a keyboard or a sequencer. The more of it we build ourselves, the more fun it will be. On my way home I got a couple of other crazy ideas involving large, translucent tubes with jacobs ladders inside them and microphones in the tubes to capture the sound of the sparks so we can process the sounds before pumping them out on a PA system. It would also be interesting to build a (MIDI-controlled) percussive instrument based on gas, pipes, some solenoids and spark plugs, but I'm afraid the fire department may have something to say about that. Don't forget the fire -- we want this to be the most dangerous piece of music ever! You could make it into an art project by putting a 3G receiver into the mix and playing the white noise on the thing. If modulation is a requirement, we have to go solid state. This is new territory for me in a Tesla context, but I've wanted to build one since I laid my hands on McCauley's DRSSTC book. I've also regretted never having learned to play an instrument. In other words - I'm in. Circuit boards for relatively small solid state coils (3-4 foot streamers) are available commercially, but this is hardly "over the top". It's also much more rewarding to design and build something from scratch than to just assemble "off the shelf"'ish components. The solid state coils are a bit more complex (some orders of magnitude IMHO...) than the traditional coils, so we'll need to do some research into the driver circuitry and how to scale up existing designs. PPS. Do you plan on having a horn section ? I don't believe anyone has ever attempted to interface a midi controller to the "schnorkel" of a pulse jet - yet. Hey! Great to see you here! We were talking about having a meeting with the people from TEKS next week, but they have some deadlines that they need to attend to. So we are going to meet them in week 6. They were into our ideas of setting up a "hacking space". Of course, that doesn't mean Matt, Ståle, you and I can't meet earlier. I'll be in town monday and tuesday next week. As for tesla coils, yes modulation would be a requirement. Perhaps we should build a few smaller prototypes to learn before going big? We probably should give audience safety a thought. Probably. I did think about building some MIDI-controllable actuators for a real drum set. But I would rather do the percussive instruments by way of explosions. I have been checking up a bit on the avilability of some of the more "exotic" parts we'll need for the coils. The most expensive piece of electronics are the IGBT transistors. These are high efficiency überfast switching transistors that typically can handle acouple of hundred amps at 600/1200V. possible to connect several of them in parallell to handle the load if we're scaling up. This may be cheaper than purchasing larger IGBT modules. We should have a brainstorming session where you educate us on the engineering tradeoffs we need to make and where we can do some back of the envelope calculations with regard to cost -- and possible fatalities :). If going large is too expensive/dangerous, we can greate a wow-factor by having more coils. Most acts I've seen use one or two coils. I think having 4 coils of reasonable size would be impressive in its own right. The more I read, the more convinced I am that we should start out with a proven design. Ps. Regarding the "educating" bit, you have to keep in mind that I have no formal background in electronics. I'm primarily a software guy (stalehd might disagree...;) This is just something I do for fun - and to keep sane. @HansJ: well, you obviously know a lot more about tesla coils and various other high voltage applications than I do, so you would be able to help us understand what knowledge we need to acquire. Starting with a proven design sounds like a good idea. > Do you have any idea about size <-> decibel mapping on these things? (http://tinyurl.com/yc4z2za). Some of them contain lead, so it might be difficult to import them via normal channels. Bwahahah. I can't wait for your first concert. Sounds like something out of THHGTTG: Best enjoyed in a reinforced concrete bunker some thirty-seven miles away from the stage. @AndersM I _was_ suggesting to Bjøn that we call the band "Disaster Area". I might need to spend a year legally dead for tax reasons, so it could work out in other areas too! Turns out I don't need to go to Oslo until wednesday evening or early thursday morning. How about getting together tomorrow (tuesday) to discuss some ideas? I can possibly do wednesday as well. I've got a Guitar Hero controller gathering dust. Tuesday or wednesday evening are ok for me (after eight'ish) ? So wednesday 20:00 somewhere at Solsiden seems to be what we agree on.